Pumpkin pie has been a popular dish for almost half a millennium but the first servings of the dessert were not quite like it is today. Jennie Geisler, a reporter for the Erie Times-News, explained that in the 1600s, when the Native Americans and pilgrims had a meal together, white refined sugar was in short supply or not readily available like it is today. Because of this, the Native Americans and pilgrims had developed a taste for sugar quite yet. Instead, they used squash to sweeten their pumpkin pie. Back then, cinnamon, ginger and nutmeg spices may have been used with the pumpkin pie. The pie that the Native Americans and pilgrims created and baked is unrecognizable to ours. They would have mixed mashed squash and pumpkin with milk, possibly corn syrup within the pie, and maybe used flour for a crust. Back then, the Native Americans and pilgrims enjoyed a baked custard with their pumpkin pie with a type of bread-like crust. They did have fire ovens, but they were not as sophisticated as they are now. “The fire ovens may have burnt the pie or did not quite bake it through completely, unless they were good at what they were doing because they did not have ovens that preheated to 450 degrees,” said Geisler. Nowadays, we get our spices imported from around the world, sugar is in great supply, dairy cows have been domesticated for creams, flour is from wheat and there is an abundance of sugar and butter. When Geisler was asked if she enjoyed pumpkin pie, you could hear the passion in her voice. “Oh my goodness yes! With plenty of whipped cream,” she said. She also knew someone who baked a pumpkin pie into a cake. “It was amazingly difficult,” she said. “It took her days to do it all. The last record for the largest pumpkin pie was from September 2010. The pie was made by New Breman Giant Pumpkin Growers at New Bremen Pumpkinfest in New Bremen, Ohio. The weight of the pie was 3,699 pounds. The diameter of the pie was 20 feet and the crust was made with 440 sheets of dough. To make a pumpkin pie one will need to gather all the ingredients. First, the crust will be made. In a mixing bowl whisk together 1 ¼ cups of all-purpose flour, 1 tablespoon of granulated sugar and ¼ teaspoon salt. Add 8 tablespoons of unsalted butter that is cold and diced into ½ inch cubes. Use a long-pronged fork, cut the butter into the flour mixture until the mixture resembles coarse crumbs with some pats of butter throughout. Drizzle 3-5 tablespoons of ice water into the mixture, one tablespoon at a time, while tossing with a rubber spatula and adding water just until the mixture starts to come together. Drop the mixture onto a sheet of plastic wrap and then press and shape into a 6-inch round disk. Plastic wrap the pan and refrigerate for 30 minutes. Dust a work surface with flour, bring out the chilled dough and place onto the floured surface. Dust the top with flour and roll it out into an even 12-inch round pie pan. Fold the dough in half, fold in half once more and carefully transfer the dough to a 9-inch pie plate. Trim the uneven edges and tuck the overhang underneath. Preheat the oven to 375 degrees and transfer the crust to the refrigerator and chill 10 minutes while the filling is prepared. Second, the filling for the pumpkin pie will be mixed together. In a mixing bowl whisk together ¼ cup granulated sugar and 1 ½ teaspoon cornstarch. Then add in 4 ounces of softened cream cheese, 1 teaspoon ground cinnamon, ¼ ground ginger and ¼ ground nutmeg. Mix all of these ingredients with an electric mixer, beat until smooth. Scrape down the bowl and mix in ½ cup of packed light-brown sugar and ¼ teaspoon salt. Next, mix in 2 large eggs and 1 large egg yolk. Blend in a 15-ounce can of pumpkin puree and 1 teaspoon of vanilla extract. Finally, mix in ¾ cup of half and half and pour the mixed batter into the pie crust. Bake 30-35 minutes until the edges are starting to set. Remove the pie from the oven when it is done baking. Lastly, there is the option to add a streusel on top of the pumpkin pie. In a mixing bowl whisk together ½ cup of all-purpose flour, 2 tablespoons granulated sugar, ¼ teaspoon ground cinnamon, ⅛ teaspoon salt and 2 tablespoons of packed light-brown sugar. The brown sugar should be broken into clumps with your fingertips as needed. Add 4 tablespoons of unsalted butter, cold and diced into ½-inch cubes. Using a long-pronged fork, cut the butter into the mixture until it resembles small crumbs. If desired, 1/3 cup of chopped pecans can be added to the streusel topping. Sprinkle the streusel on top of the pumpkin pie that just came out of the oven. It will need to be baked for an additional 25-30 minutes longer or until the filling is set. A fun way to see if the filling is baked through is to stick a toothpick in the middle of the pie and remove it. If there is anything attached to the toothpick the pie needs more time to bake. If the toothpick is clean the pie is done. Cool the pie completely at room temperature. Slice and serve the pie whenever but remember to store the pie in the refrigerator. This is because there are ingredients that could go bad if left out. 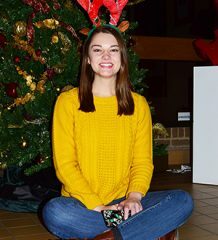 Hannah Roseberry, a junior business administration major at Gannon University, loves pumpkin pie. Whenever she eats pumpkin pie she is “instantly taken back to when I was younger,” said Roseberry. 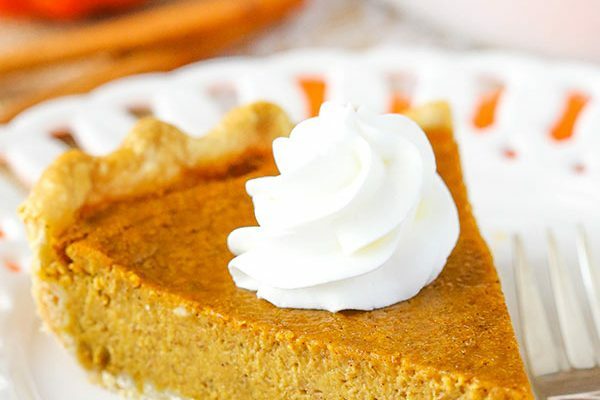 “Pumpkin pie also reminds me of the fall activities we would do; going to different pumpkin patches and picking out the best pumpkin to carve and roast the pumpkin seeds.” She said she also thinks of all the family gatherings because they were always in the oven baking, creating a warm and homey aroma. Taiya Fallon, 39, has always loved pumpkin anything- especially pumpkin pie. Ever since she was a little girl, her mom would make a pumpkin pie from scratch for Thanksgiving. Her mom would pull up a chair from the dining room so she could stand and help mix the batter. Fallon has passed the tradition onto her two children, Shaffer and Isley, ages 5 and 4. They love to take turns mixing the batter and pouring it into the crust. They have been helping since they were 3 and every year they can help with a new task with creating the pumpkin pie.